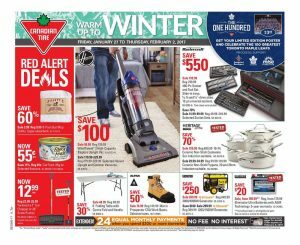 Are ready for reaching pretty wide list of Canadian Tire Flyer January 28 2017 including many types of essential items with lower prices ! Everything that you need every time in your life can be found at reasonable prices in their stores. Moreover , perfect deals and easy payment options for a good shopping are regularly offered by them every week. I think , it’s a great option to make an installment plan. Keep your money in your pocket. 24 equal monthly payments here when you spend $200 or more storewide ! “Red Alert Deals” , “Deal Of The Week” and many great savings up to 75% are featured on this special flyer on this week. Especially , you should check cover page of this flyer. The best prices and products are available on this page. All products are on discount ! For example ; Heritage 10-pc ceramic non-stick cookware set is starting $29.99. Buy this and catch up 70% savings.